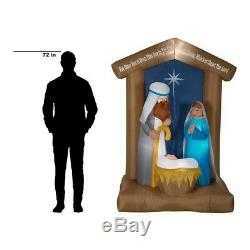 Inflatable Nativity w Archway Airblown Scene Traditional Yard Pre-lit 6.50 ft. Adorn your lawn with this Airblown Inflatable Nativity scene featuring Baby Jesus, Mary and Joseph. Delight children and adults alike with this symbolic Christmas decoration that self-inflates in seconds and includes energy-efficient LED lighting for nighttime visibility. Plug it in, stake it down and watch the magic unfold. Includes everything needed for easy outdoor setup. Width: 0 x height: 0 x length: 0 x weight: 0. Our stock all ships from our US-based warehouses. Because of the efficient manner of our ordering system, orders placed cannot be canceled half an hour after they are made. Please check the Voltage information and make sure it matches the one in your country. In case it's not stated in the description, do ask us. Item can only be sent to a physical address. NO APO, FPO, DPO, Or US territories and protectorates. We usually respond within 24 hours on weekdays. 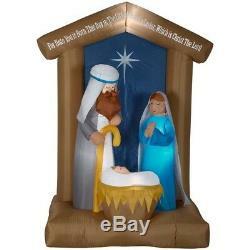 The item "Inflatable Nativity w Archway Airblown Scene Traditional Yard Pre-lit 6.50 ft" is in sale since Sunday, October 28, 2018. 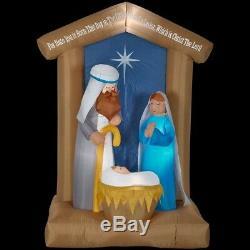 This item is in the category "Collectibles\Holiday & Seasonal\Christmas\ Current (1991-Now)\Yard Décor".homeimprovement" and is located in Miami, FL.